Just Listed :: Gorgeous Home in Chastain! Whether looking for amazing city living or elegant Southern charm, this Chastain Park home has it all. The open floor plan, high-end custom features, and elegant character will never go out of style. 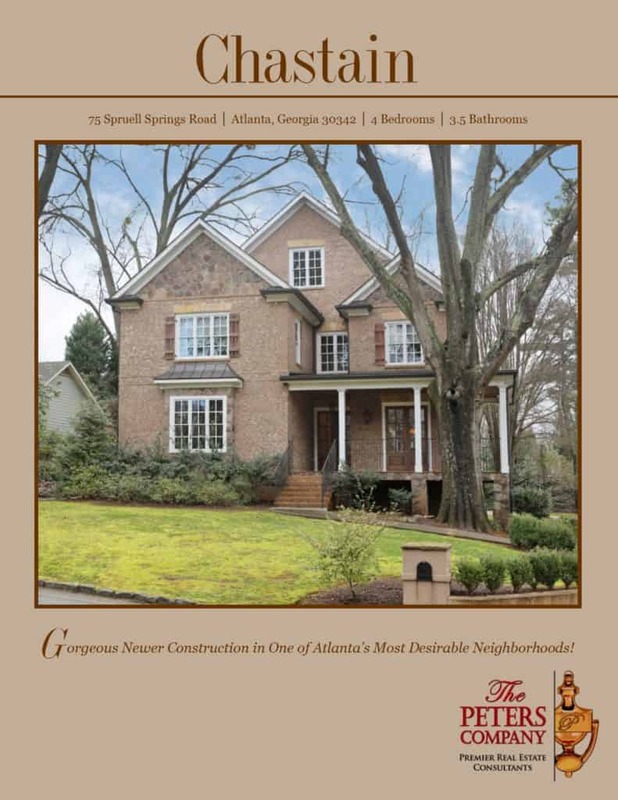 You will love being close to all that Buckhead and Sandy Springs have to offer with easy access to the highways, shopping, and restaurants that make this area such a sought-after destination. Not to mention you have all of the best private schools so close by! Gorgeous hardwood floors, extra tall ceilings, and beautiful trim work are carried throughout. A chef’s kitchen is complete with magnificent granite countertops, upgraded Bosch appliances, custom cabinetry, an oversized island with breakfast bar, and walk-in pantry. A sun-drenched breakfast room off the kitchen is the perfect spot for casual meals at home. A tongue and groove ceiling adds lovely detail to the space. The spacious family room has a spectacular fireplace that’s both gas and wood-burning complete with a gorgeous stone surround. A formal living room and wet bar area provide wonderful living and entertaining space, perfect for grand parties or intimate soirees. The separate formal dining room is open, well-lit, and perfect for the finest of dinner parties or hosting memorable holiday gatherings. The dining room’s French doors lead to a wrap-around stone terrace that’s ideal for entertaining or simply enjoying a quiet morning espresso or cappuccino. A butler’s pantry connects the kitchen and dining room, providing plenty of additional storage for serving pieces, linens, candles, and wine. The sprawling master suite is a true retreat and features dual walk-in closets and a separate nursery or office space. The spa-like master bath features dual vanities, luxurious jetted tub, and separate oversized walk-in shower with dual showerheads. All additional bedrooms are well-sized and bright, each with its own generous walk-in closet. Oversized laundry room is conveniently located upstairs. A full staircase leads to the huge third floor/attic space that could easily be finished as a media room, playroom, office, teen suite, or man cave. The unfinished basement is just waiting for your ideas… whether a media room, home theater, game room, gym, flex space, or in-law suite. A true mudroom awaits book bags, coats, shopping bags, pet supplies, etc. The two car, rear entry garage is a rarity! It easily fits your vehicles along with providing extra storage space. Mature hardwood trees add plenty of curb appeal to this already stunning home. An irrigation system, central vacuum, and re-circulating hot water for the master bathroom are wonderful additional features.